Andrea Hershatter never forgot hearing those last four words in 1988 from legendary Goizueta Dean John E. Robson, spoken as he left Emory to serve as deputy secretary of the treasury at the request of the first Bush Administration. Bold leadership and innovation established during his era wouldn’t survive on autopilot. It demanded constant nurturing, adapting and risk-taking. "There are wings to fly here..."
For more than 30 years now, that challenge has resonated and guided Hershatter, like the last words from Obi-Wan Kenobi to Luke Skywalker, from T’Chaka to the Black Panther... Luckily, she’s had someone by her side to remember the legacy. Someone to also carry the torch. Someone to, well, not screw up. Julie Barefoot, who at the very same time just more than 30 years ago, was recruited and influenced by Robson. The two are often contrasted as tenacious anchors — Hershatter as senior associate dean of undergraduate education and BBA program director, Barefoot as associate dean of MBA admissions. At the three-decade mark, their fingerprints can be found on the unique paths of each BBA and MBA student. In the span of five school deans and five Emory presidents, Hershatter and Barefoot kept stoking what Robson had inspired in them — becoming nonstop pistons in the Goizueta engine so that, today, they seem inseparable from the school itself. If Hershatter and Barefoot worried about letting down Robson, they didn’t show it. 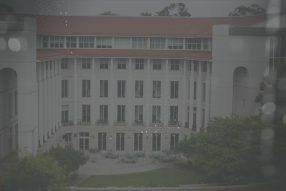 They were too motivated to live up to his aspirational vision for what was then called the Emory Business School. With a mandate from Emory President James Laney to crack the nation’s top 20 business schools, Robson set to work with big moves and big plans. He believed business, government and public policy must work together to solve complex issues of commerce. He pushed to go beyond the bottom line, the status quo and the boardroom. He changed the business school’s tenure policy, recruited stalwart faculty members like Benn Konzynski, Jag Sheth and Jeff Rosensweig. He sought an administrative staff just as sharp. Hershatter and Barefoot interviewed at the same time for the position of director of admissions, a key role as lead recruiter and gatekeeper. Hershatter came in with admissions experience from Duke and an entrepreneurial pulse. Barefoot was escaping the private sector and looking for work she could believe in. Rather than lose Hershatter or Barefoot, Robson kept both as a team. “John was fearless in creating change and upending the status quo,” said Hershatter, whose intense creativity is matched by deep loyalty. “He was known as a transformation guru who came in very willing to clear away dead wood, wherever he found it, and to invest in future stars who profoundly shaped this school. Simultaneously he made the somewhat controversial decision to empower senior staff to really work as a strategic cabinet to drive the school forward — he encouraged and helped to champion initiatives as long as the ideas were for the good of the school and feasible with respect to resources. Every dean since then has taken this philosophy in a different direction, but I’ve always felt one of the most rewarding benefits of being at Goizueta is that it is a place where good ideas have the opportunity to bubble to the top and then be supported. In 2009, Emory's Goizueta Business School honored Andrea Hershatter and Julie Barefoot with the Staff Impact Award. Andrea positively impacts everyone she is around. She genuinely wants to do the very best by the students and by the school. With her intelligence and strategic thinking, Andrea is a role model for staff, students, and leaders. Julie is known and admired for her integrity and dedication. She always goes the extra mile to do tasks correctly and to do the right thing. Julie is incredibly diplomatic and makes everyone feel special. "We were doing some daring things, because we wanted to dramatically increase the quality of our class." To the ever-poised Barefoot, Robson was a “most dynamic, energetic person.” His makeover of the business school boosted her momentum for a personal reinvention. As an honors English major at The University of Alabama, she believed in higher education as a critical pathway to a meaningful life. After an MBA from the University of North Carolina and five years as a commercial loan officer cold calling out of a small office, she wanted work that aligned with her values. Emory gave her that and the position to match prospective students with their sweet spot at Goizueta. “That’s one thing I like about my job; I get to see the future,” said Barefoot, a nationally quoted expert on MBA admissions who recruits in a dozen countries, puts on 100 recruiting events a year and pens a personal note on every acceptance letter. As high as the pair’s expectations were, their beginnings were just as modest. “Andrea and I had a receptionist and work-study students, and when I started in March, we had nothing planned for graduation,” Barefoot recalled. “We ended up having it in the courtyard behind Glenn Memorial Church with punch and cookies. We did admissions, orientation and graduation for all the programs. We even read all the applications and interviewed everyone. Under Hershatter's leadership, the BBA program has ranked among one of the best in the country and programming has expanded to include various concentrations across campus. Today, Hershatter and Barefoot’s teams work from opposite ends of the school’s horseshoe footprint. Hershatter’s BBA Program includes 15 team members and Barefoot's prospects are served by a staff of 13 in MBA Admissions. As that growth took place, the school’s mission and possibilities became personal to Hershatter and Barefoot. The more they grew and helped the school, the more embedded into their lives the work became. Away from work, they raised four children, three of whom attended Emory. Including two who are proud Goizueta BBA graduates. Parenthood gave them deeper appreciation for the pressures faced by Goizueta students trying to find their way as fulfilled adults. As the school expanded its international presence and added a PhD, MEMBA and Evening programs, Hershatter and Barefoot remained vigilant in keeping the intimate student experience at the forefront. "We want [students] to be always cognizant of the need to reflect on what they are doing and determine their paths apart from the expectations of parents and peers." As the decades passed, data became more abundant, and Hershatter and Barefoot used analytics to fine-tune and adapt their programs and methods. Detailed feedback from faculty, students and recruiters continuously improved their admission decisions and helped make programs relevant to the changing needs of business. Goizueta today promises students they will grow in many ways, most notably in their insights, because they will glean invaluable knowledge from people who help them along the way, and will be armed with the tools to produce results that are meaningful to them personally. That claim is authentic because of Hershatter and Barefoot’s consistent nurturing of individual personhood at Goizueta. At the time Andrea Hershatter and Julie Barefoot joined the staff, the school was not-yet named for former Coca-Cola Chairman and CEO Roberto C. Goizueta, though they both instantly adhered to values espoused by his time in corporate America. With the BBA program, Hershatter is driven to ensure every student learns at the intersection of their passions, potential and purpose. She personally loves music, and just as she believes legendary songs are rooted in storytelling, so too are the most satisfying business careers rooted in understanding one’s own story. Preparing to make a difference in global business depends on more than grades and competencies; a student must know and communicate an authentic value based on his or her unique strengths and passions, and execute over time to build integrity. The pair would also make difficult decisions based on Robson’s key ethics heuristic, what he called the front-page-of-the-New-York-Times test. She still checks her actions against this several times a week. Barefoot distills this idea to another four-word motto: Stick with the truth. Hershatter (@ahershatter) and Barefoot (@barefootgbs) have each become power users of Twitter during their time at Goizueta, using it as a way to communicate their travels, opinions and thoughts to various audiences. "I am lucky to have a boss who sees that the relationships we build over time are a gift to our students, ourselves and the school." Their ethics, style and productivity continues to impress their boss. "Our BBA program, in many ways, is a personification of Andrea,” James said. “Our students are strong and dedicated to their cause be it academics, nonprofits or their families. Andrea returns that behavior with a devotion unlike any I've seen. She loves and respects all of her students, and I believe they work harder knowing they have that support from her and the program office." "The MBA programs would not be where they are today without Julie. Period,” James continued. “She has built a team over the last three decades that understands exactly what kind of student will excel in our programs and life. But it's the relationships she has — and the way she cultivates them — that make her truly special. In many ways, she is a face of the business school." Another measure of Hershatter and Barefoot’s longevity and adherence to principles is how much they inspired the same from those around them. At Goizueta since 2000, Libby Egnor has supported Hershatter and observed the level of activity required to make the program successful. Just in this semester, Egnor has seen her balance hosting undergraduate deans from Wharton, Berkeley and Cornell for external review, reinvent and run the fourth Entrepreneurship Summit, launched the inaugural Arts Management Trek to New York and tackle coursework for a Stanford summer class on design thinking that she will participate in as a student. All of this was on top of teaching her senior seminar, advising hundreds of students and running the BBA program. At Barefoot’s side for 18 years has been Libby Livingston. Riffing off her boss’s warmth and creativity, Livingston arranged 30 celebrations to mark Barefoot’s service milestone. Current and former MBA Admissions staffers celebrate Barefoot. One day, everyone wore scarves (like Barefoot does). There were 30 donuts one day and an art gallery of amateur portraits of the director. Past MBA admissions staffers showed up to surprise Barefoot or sent notes and videos. “One of the ways Julie is so thoughtful is that she’ll see an article in the paper that she thinks you might be interested in and will clip it out, write a note on it and put it on your desk. Or if it’s for the whole office, she will make copies and hand it out in a staff meeting always telling us that we don’t have to read it, but it made her think of us,” Livingston said. “She’s given me articles on Instant Pot, how to make my dog Instagram-famous, migraine treatments as well as work-related pieces on MBA trends, test waivers. Hershatter and Barefoot focus on always. Their consistent emphasis on how students are educated and treated, and the importance of innovation, align with Roberto Goizueta’s philosophy of doing good even if it is eventually forgotten. By 1994, when the school took on his name, Hershatter and Barefoot had established bona fide personas and reputations. Today, as the school nears 25 years with the Goizueta name and 100 years of existence, they recall fondly brief meetings they had with Goizueta and his family. For them, the work has been, and will forever be, always about relationships. That unwavering focus for three decades kept them from screwing it up.